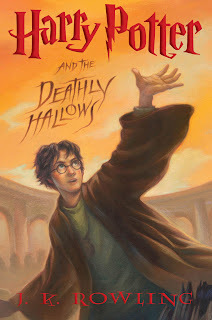 On the heels of rereading and seeing the movie version of Half-Blood Prince, I decided to reread this one as well. I still think it's pretty slow at times and fairly unsatisfying in some respects as an ending to the series. I was not happy with the movie version of HBP and haven't been happy with the work Yates has been doing as director. Too many things changed from book to movie that didn't make sense to me. And now, after rereading Deathly Hallows, I am very unhappy. There are things they changed in HBP that directly relate to important events in DH which means more senseless changes are coming. Why base it on the book at all? Why not just take the character of Harry Potter and do whatever you want with him? That seems like exactly what they are doing. I have a hard time believing Rowling is okay with it all but I guess money talks. That's too bad. I'll give the last movies a chance but I don't hold up any high hopes. After that, who knows. Harry Potter vs. Predator anyone? Unfortunately too many directors think too highly of themselves and overreach when making movies. I think sometimes they are frustrated writers and try to turn a great book into what they wish they had written. And then wonder why all the fuss when the movie is bad.